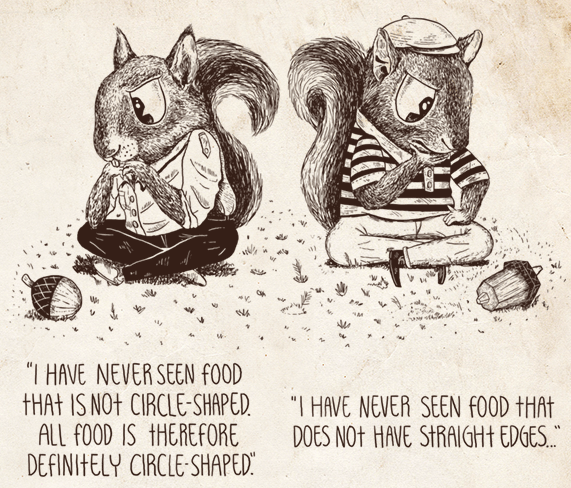 I have long wanted to introduce the online resource Illustrated Book of Bad Arguments. We have already discussed in numerous posts the the importance of logic and critical thinking, and how these tie to rhetoric. An email from a Birmingham RE teacher seeking advice finally got me to do something about it. I originally came across this little gem while scoping out materials for what has now become the identity and community building course for Muslim private schools 21c British Muslim; the Solution? Not only do the illustrations make Book of Bad Arguments suited even for Primary, but each argument comes with short explanation outlining key points to the teacher (What exactly is Equivocation? – in case you can’t quite remember). However, my point is of course that brilliant materials related to thinking are not very useful when taught from the board – they must necessarily be discovered through thinking, or there will never be ownership. This is where the careful classroom management afforded by Cooperative Learning comes into play – simple, shake-and-bake student-centred learning in small manageable blocks. First, break up your class into four-man teams and hand out a printed copy* of your favourite bad argument to each student, see example above. (Note that any necessary preparation in relation to context, vocabulary and so forth, as well as the duration of each step, depends on your best judgement as a teacher). Working alone, each team member muses over the picture and text, reflects on possible solutions for a given duration, taking notes. (Which will form evidence of learning later). Teams divide into two pairs of shoulder partners who discuss their solutions, arguing their point, possibly creating a synthesis. (Again decide if you want to support this process with a written element). Students share their best ideas within the pair in front to deepen their thinking and better prepare a final statement to present to class. Do not forget the importance of unobtrusive monitoring during steps 3 and 4 as the candid verbalization of opinions during the debate gives teachers a unique insight into the knowledge and thought processes of each individual student. If you want to present more than one argument simultaneously, try the Jigsaw Puzzle we have outlined. Simply choose your four best ones. More than four. Give one Argument to each team, let them Think-Pair-Share their way to a communal written statement and send out three students to explore other teams’ arguments, bringing them safely home to be discussed and shared in a Word-Round (Thursday’s course attendees should search for the Learning Process Domain “Thinking Skills” in their handouts). This text would be ideal for use in an introduction to thinking skills lesson, for two reasons. Firstly, the content itself exemplifies the kind of sloppy use of language and reasoning: How can someone be involved in an alleged plot? To be involved in something, it has to exist; if it only allegedly exists then you can only be allegedly involved, surely? But of course, the allegation by itself is enough for the hard of thinking, for whom evidence and argument are merely confusing. By observing some of this discourse, one gets the feeling that a noticeable amount of it suffers from the absence of good reasoning. So is this Telegraph article using Equivocation? Thinking skills, it would seem, are not just for children these days. See these articles for more on Philosophy for Children and how it relates to the Trivium, which used to provide a anti-nihilistic safety-net against Mr Robinson’s Destructive Why. For an example of winning a debate in the classroom, see Lefty child-centred teaching, indeed! It’s as odd as Sir Michael’s original comments. For more on RE courses see other site. * Note Book of Bad Arguments is shared under a Creative Commons BY-NC license, which means that you can freely share and adapt it for non-commercial use with attribution. ** This section is an extract from the co-authored article For Whom the Bell Tolls – The Trojan Horse Autopsy Toolkit to which I contributed on the Cooperative Learning importance of Higher Level Thinking skills.